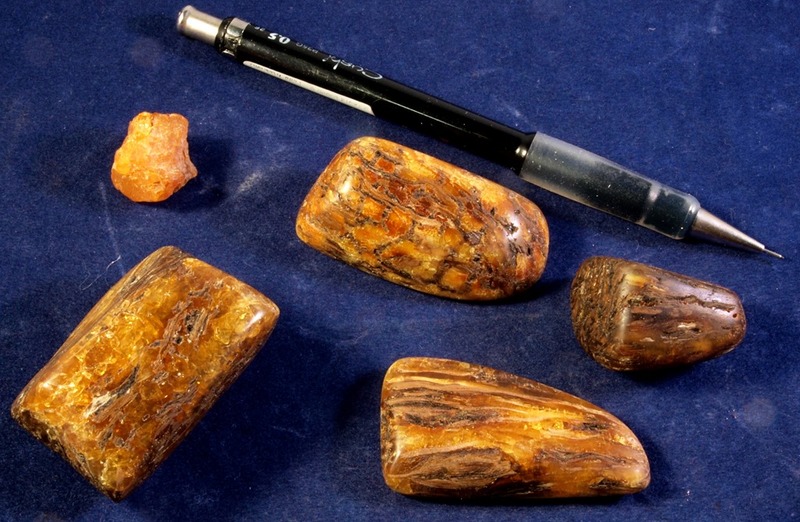 Pictured above are several polished samples of the fossil amber; the sample in the top left is unpolished. Amber is the fossilized resin of a tree. As you can see, some of the wood of the trees got preserved with the resin, which gives this amber a wood-grain appearance . These pieces were collected near Malvern, Arkansas, where amber is found in beds of lignite: a soft, low-grade coal. People have prized amber since pre-historic times for its beauty and its scent. It continues to be popular today in the production of jewelry and perfume. This entry was posted in #geoblog, GeoPic of the Week and tagged Amber, Arkansas, Fossil, Malvern, Perla, Resin, Wilcox Group on March 31, 2016 by argeology. This is an anticline exposed on Mc Leod Street, southwest of Hot Springs, Garland County, Arkansas. It’s not unique as, anticlines are common in the Ouachita’s and other mountain ranges throughout the world. Most often though, these structures are large scale and cover expanses of land that can’t be viewed from a human vantage point. When they do form on a scale that’s small enough for human observation, we typically don’t have the benefit of a freshly blasted exposure like this one. In fact, many times geologists must infer that folds like this exist in places deep underground that no one has or will ever see. That’s why, if you see a geologist on the side of the road, taking something like this in, as in the picture above, just let him have his little moment. The exposure is of deep marine sedimentary deposits of the Stanley Formation. 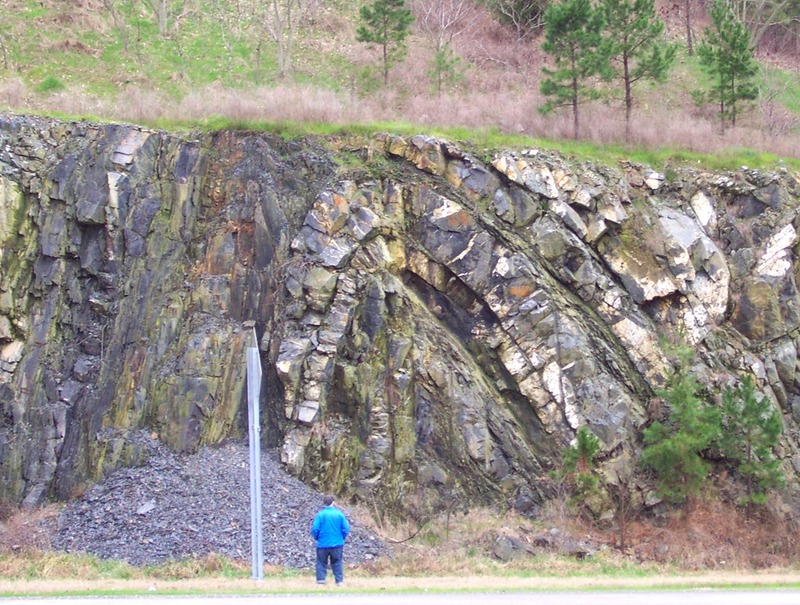 This entry was posted in #geoblog, GeoPic of the Week and tagged anticline, Arkansas, deformation, Garland County, Hot Springs, Ouachita Mountains, Stanley Formation on March 24, 2016 by argeology. Fig. A – Many flute casts that truncate one another. Black arrow points downstream. Fig. B – Flute casts with characteristic round heads pointing in upstream direction. Black arrow points downstream. Pictured above are beds of sandstone displaying flute casts. 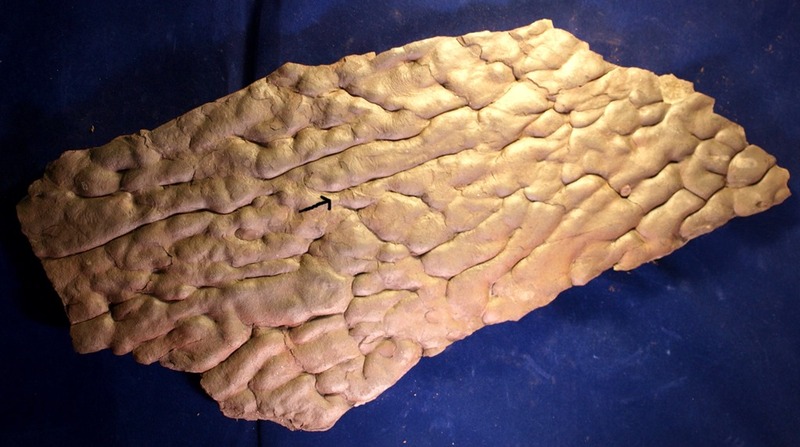 Flute casts are common in channel environments (for instance river channels) where water is carrying sediment and debris (rocks, shells, sticks etc..). As debris is carried along, it randomly grazes the mud in the channel bottom, scouring divots. The divots are typically deeper and narrower in the upstream direction, with a round head pointing upstream. Flute casts form subsequently when sand in-fills these divots and later becomes a rock, preserving casts of the divots on the bottom of the sand bed. 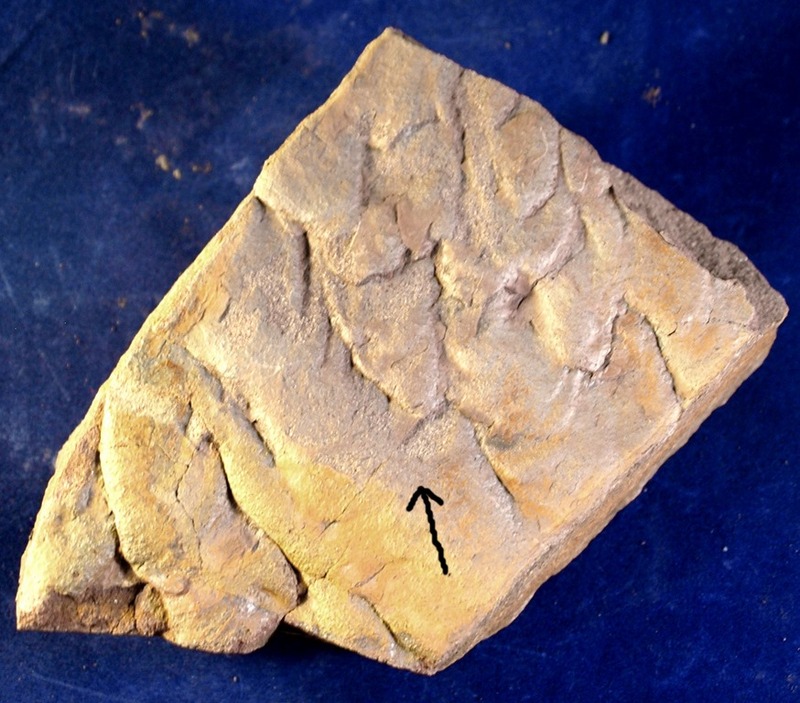 Flow direction indicators, such as flute casts, are one of many clues geologists use to reconstruct the history of the earth. This entry was posted in #geoblog, GeoPic of the Week, Sedimentary Features and tagged Arkansas, bumgarter quarry, flow direction indicator, Flute cast, jackfork formation, sandstone on March 16, 2016 by argeology. Above is a picture of lodestone, which was collected from Magnet cove, Arkansas. Lodestone is composed of iron and oxygen and is just like the mineral magnetite except, lodestone is naturally magnetic. Magnetic minerals are rare on earth but, they have been a crucial part of human evolution. Discovery of magnetic lodestone by ancient people led to the invention of the compass. The compass, in turn, revolutionized navigation, and lead to the spread of technologically advanced cultures around the world. Scientists are still uncertain how lodestone became magnetized but, the most accepted theory holds that it forms when magnetite is struck by lightning, which has a strong magnetic field. 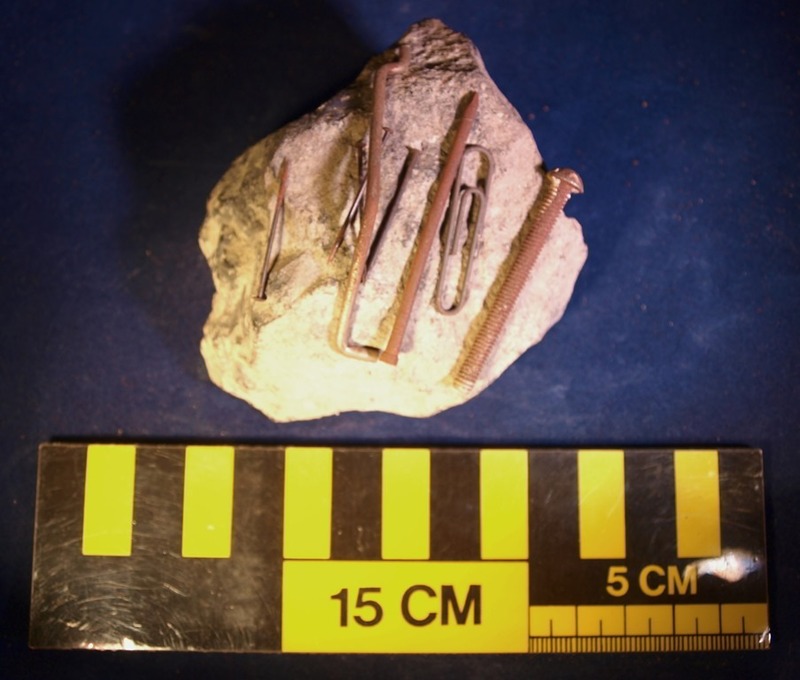 The fact that lodestone is primarily found at the earth’s surface supports this theory and scientists have been able to produce rock identical to lodestone by exposing magnetite to lightning. This entry was posted in #geoblog, GeoPic of the Week and tagged Arkansas, compass, Hot Spring County, Magnet Cove, Magnetite, minerals, navigation on March 11, 2016 by argeology.